Re “Traveler reunited with stolen mule in Escondido” (Feb. 26): I saw John Sears and his mule, Little Girl, Feb. 18 walking down Melrose Avenue. I drove by, my eyes on his overly burdened mule trailing behind him. For those that may think his lifestyle is adventurous, I see it differently. Sears’ decision to live on the streets forces Little Girl to also do so, showing no concern for her well-being. Later, coming out of a market on Melrose, there was Sears and Little Girl. I asked Sears about the weight she was carrying. I cringed when she kept picking up her back feet as we humans do when experiencing discomfort or pain. I looked into her face, such a sadness. Little Girl is neither safe from Sears or from people who take her in the middle of the night. Glamorizing Sears and his way of life ignores the welfare of Little Girl. We sent the article to Andrea, the Registered Veterinarian Technician who cleaned Little Girl’s teeth. She sent us her response that she wrote the San Diego Union-Tribune about that opinion as she feels that it is important for people who don’t know anything about mules and horses to understand. I am hoping that you can post this in response to the opinion piece regarding the mule Little Girl and her owner. I am a Registered Veterinarian Techinican that works at an equine veterinary practice here in the Escondido/San Marcos area. I work strictly with horses and have been doing so for over 15 years. I can understand where someone who does not have equid experience may see Little Girl and feel sorry for her. Myself as well as two of my colleagues were lucky enough to visit with Little Girl the other day for a vet health check up. She was given a general health check and she had her teeth floated and equilibrated. Mr. Sears had a lengthy conversation with the veterinarian regarding her health and other questions he had regarding her care. I can tell you from first hand experience that from the examination we gave, Little Girl is a healthy mule for her age. She has a healthy body condition score, good feet (hooves) that receive regular farrier care, healthy skin and hair coat as well as a bright and content disposition. 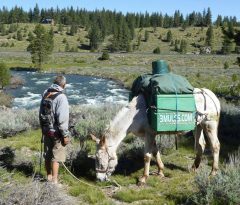 The owner is well educated on mule care and is very conscientious when it comes to the amount of weight she is asked to carry. She gets many breaks throughout a days travel and is cared for quite well. I see other equids on a regular basis that are not in as good of shape that she is in. I hope that this insight helps those that are concerned understand the reality of the situation a little better and puts their minds at ease. The Mules are not homeless. We’ve been wandering, living on this earth for hundreds of thousands of years. A stick structure is not what we seek. We seek spiritual connection to this earth, while living in balance, respect and reverence for all its inhabitants. Earth is our home. No matter how many editorials that are fired off, the Mules will not let loose of our sacred connection to this sacred place called Earth. When Little Girl can no longer serve this place of one human being walking with his/her animal companions in one of all four directions, how we choose, when we choose, she will be retired into the nation, 3 Mules Nation, and live out her remaining years in by far better conditions than 90% of people living today.